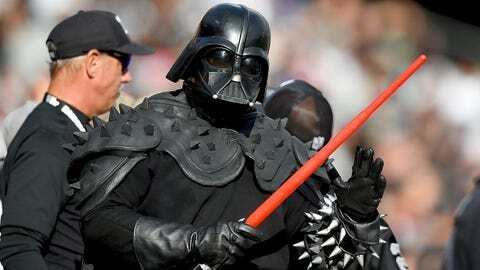 Darth Vader has long been synonymous with the NFL -- particularly in Oakland -- and it looks like his presence will definitely play a large role in the new 'Star Wars' film. The Giants/Eagles game took a backseat to "Monday Night Football’s" main event — the halftime premiere of a new "Star Wars: The Force Awakens" trailer. It also went online moments after. The 2:35 minute spot offered teases into the backstories of the series’ newest characters, like John Boyega’s Finn, a stormtrooper who’s questioning his allegiances, Daisy Ridley’s scavenger Rey, seen exploring an old ship, and Adam Driver’s Darth Vader-obsessed Kylo Ren. "The Force Awakens" takes place some 30 years after the events in "Return of the Jedi," but the plot for director J.J. Abrams’ film has remained shrouded in secrecy. This latest spot gave a few tantalizing hints as to what might have transpired in those three decades. For one, the events of the original trilogy seem to have been turned into mythology for the younger generation. Harrison Ford’s Han Solo tells Rey and Finn that "it’s true . . . all of it." The trailer also gave fans their first look at Carrie Fisher who is reprising her role as Princess Leia. Luke Skywalker, portrayed again by Mark Hamill, has yet to be seen in full in any of the film’s advertisements and is suspiciously missing from the official poster, too. Teasers and trailers have become events in and of themselves for "The Force Awakens," one of the most anticipated movies of the year. The last premiered at a ticketed fan event in Anaheim, Calif., to fan cheers and excited tears in April and has over 64 million views on YouTube to date. This latest outing was at least in part an experiment in corporate synergy. "Monday Night Football" airs on ESPN, which, like Lucasfilm, is a subsidiary of The Walt Disney Company. 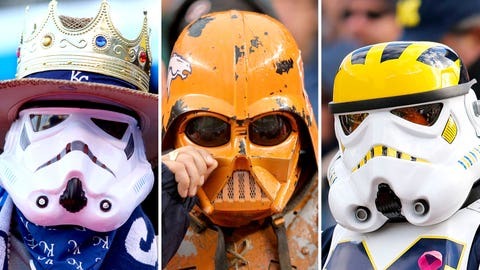 Many "Star Wars" fans who aren’t necessarily inclined to watch football tuned in to the game to wait for the trailer. Disney, which acquired Lucasfilm in 2012, has been strategically limited in its official marketing of "The Force Awakens" — the first in a new trilogy in the series. "Looper’s" Rian Johnson is directing Episode VIII for a May 2017 release and "Jurassic World’s" Colin Trevorrow is set for Episode IX for 2019. Lucasfilm is also working on a series of stand-alone spinoff films set in the world of "Star Wars," like "Rogue One," about the rebels that steal the plans for the Death Star, set for December 2016. But for now, all eyes are on "The Force Awakens," which is expected to be one of the most successful films of all time.